All 2018 Command Senior Enlisted Leader assignments for all branches of U.S. Armed Forces. The CSEL is the direct representative to their principal on all matters pertaining to efficient and effective management of day to day activities in their area of responsibility (AOR). See here for the 2019 Command Senior Enlisted Assignments. Command Chief Master Sgt. Philip L. Easton, currently assigned as the command chief master sergeant, U.S. Air Forces Europe and U.S. Air Forces Africa, with headquarters at Ramstein Air Base, Germany, has been selected to replace Fleet Command Master Chief Crispian D. Addington as the command senior enlisted advisor for U.S. European Command, Stuttgart, Germany. Army Command Sgt. Major Tomeka N. O’Neal, currently assigned as the command sergeant major for Headquarters, U.S. Army Joint Munitions Lethality and Lifecycle Management Command; and Joint Munitions Command, Rock Island Arsenal, Illinois, has been selected to replace Air Force Chief Master Sgt. Stuart M. Allison as the senior enlisted advisor for the Defense Commissary Agency, Fort Lee, Virginia. Air Force Chief Master Sgt. Jason L. France, currently assigned as the command chief for Headquarters Air Force Materiel Command, Wright-Patterson Air Force Base, Ohio, has been selected to replace Air Force Chief Master Sgt. Matthew M. Caruso as the command senior enlisted leader for the U.S. Transportation Command, Scott Air Force Base, Illinois. Navy Command Master Chief Karl W. Parsons, currently assigned as the command master chief of Strike Fighter Squadron Eight, Carrier Strike Group Two, Naval Station Norfolk, Norfolk, Virginia, has been selected to replace Air Force Chief Master Sgt. Benjamin J. Higginbotham as the command senior enlisted leader for Combined Joint Task Force – Horn of Africa at Camp Lemonnier, Djibouti. Air Force Chief Master Sgt. Zaki J. Mazid, currently assigned as the command senior enlisted leader, 96th Test Wing, Eglin Air Force Base, Florida, has been selected to replace Marine Sgt. Maj. Dennis M. Bradley as the command senior enlisted leader for Joint Task Force – Guantanamo, at Guantanamo Bay, Cuba. Marine Corps Sgt. Maj. Vincent C. Santiago, currently assigned as 3rd Marine Division’s division sergeant major, Okinawa, Japan, has been selected to be the first command senior enlisted leader for the Defense Security Cooperation Agency, Arlington, Virginia. Air Force Chief Master Sgt. 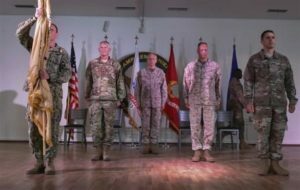 Benjamin J. Higginbotham, currently assigned as command senior enlisted leader, Combined Joint Task Force – Horn of Africa, Camp Lemonnier, Djibouti, has been selected to replace Master Gunnery Sgt. Scott L. Stalker as the command senior enlisted leader for the Defense Intelligence Agency, Joint Base Anacostia-Bolling, Washington, District of Columbia.